I had started looking at old Mercedes-Benzes, but toyed with getting back into older J-Tin since I’ve had a few Starions. The thing is, I wanted a cruiser and an automatic (GASP) since my F56 Mini fulfills my need to row. I got so far as to zeroing in on a Toyota Corona, but it just didn’t work. Too much too do, not enough parts, etc. Even with that, I kept looking at older Mercedes. The coupes and convertibles are ridiculous as far as prices for anything pre-1975, with people selling rotted husks of metal that was once a car for $8-10K. Rotisserie restores hitting 6-figures easily. But for some reason, the sedans were generally affordable, though all over the place on price. Non-running examples that looked like a rabid wolverine on cocaine lived in the interior could go for anything from $500 to $5K. Modest, running examples were starting at $2000-2500, but more commonly at $5K+. $8-12K+ seemed to be the sweet spot to find one in “pretty good but not concourse” shape. Problem was, that was above my budget, and anything below $5K was in LA (I’m in San Diego). But this one 1981 280E (later found to be an ‘82) kept popping up in my searches. I didn’t initially want this model, the W123, and wanted a stacked-headlight front end design, but this one was just too clean to ignore. It was above my price point anyway, so I kept searching with no luck within 2 hours of me. I let a few weeks go by with nothing coming up that piqued my interest. Except this W123 kept showing up. I wondered if the guy selling it just never took the ad down, but one day the post was updated with a reduced price. So I looked more into it and found so many people sing the praises of this model of Mercedes as a classic you can drive daily. Many tout of 500,000-mile examples on nothing more than basic maintenance. Some even call this the best car Mercedes ever made. In the 70s and early 80s, the US tightened the noose around emissions and gas mileage, as well as adding a very big, ugly bumper to every car of that era. For those looking for more oomph, Mercedes (among other manufacturers) was able to import their freed-up versions with few modifications for US roads before selling them to the public. They stopped this practice (because America) in 1985. This was one of those cars, the owner told me, and said that the car couldn’t be smogged in California because of this. He said it would need extensive and expensive mods to make it work, or you’d have to “know a guy” who could pass it for you. This seemed to scare a lot of people off, so it sat unsold for a couple months as he dropped the price. Even so, I got him to drop the price even further (to offset his ballpark figure to get it to pass) and I pulled the trigger. This thing is amazing. The interior is nearly flawless - the rare cloth/vinyl seats are nearly perfect. No tears and just a bit of stitching that needs to be redone. Nearly everything works. The only things that don’t (so far) are the antenna, dash lights, rear defroster, and the odometer. The “Economy” gauge doesn’t work either, but let’s be honest - it never did. I may have an easy fix on the dash lights (cleaning the connectors on the dimmer switch) and I’ve gotta check the fuses. But everything else works. Windows, sunroof, locks, all other gauges, glove box, wipers, lights... AC is there but the belt is off so I figure it needs a rebuild or at least a recharge. The big issue is the idle. It’s running SUPER rich but it’s still driveable without much trouble. I got it home from Oceanside to San Diego without an issue. Also, the W123 community has blown me away as well. Everyone seems to have incredible pride in keeping these on the road - even if it’s not theirs. I joined a Facebook W123 club the night before I was going out to check this out and they tagged a respected mechanic in the club - who happened to have a shop down the street from my work. He also happened to be going by where the car was around the same time I was going to look at it and offered - unprovoked - to take a look at it and ensure I was getting something good (which he did). 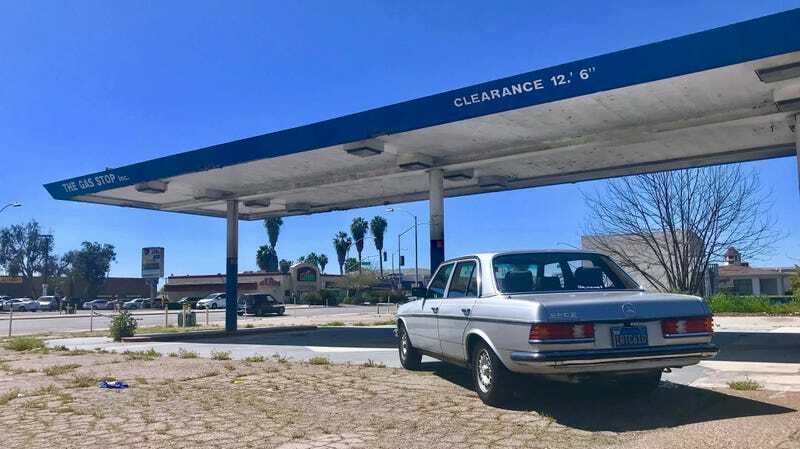 Now I’ve got someone else in the area who messaged me, excited to find another W123 in San Diego and offered to help me get everything buttoned up as well. It’s really amazing and I’ve thanked them all profusely. I can’t wait to get this Merc in top order and drive it everywhere. What a find.